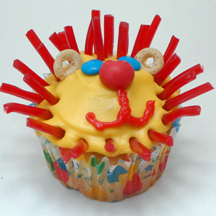 This lion looks a little goofy but kids will love sticking in the pieces of the licorice mane. What You Need: 1 cupcake; frosting tinted yellow; red licorice strings (the stiff kind); 2 Cherrios or other O-shaped cereal; 2 blue mini M&Ms; red candy such as Runts; red writing icing or gel in tube, pastry bag or sandwich bag with tip cut off; scissors. How to Make It: Frost cupcake. Place candy in center for nose. Add blue eyes (with Ms facing down). Draw red mouth using writing icing or gel. Cut licorice in various lengths and poke around edges of cupcake for mane. Add 2 Cheerios for ears. This entry was posted on Monday, August 25th, 2008 at 2:30 pm	and is filed under animal cupcakes. You can follow any responses to this entry through the RSS 2.0 feed. Responses are currently closed, but you can trackback from your own site.